When Fear Steps in the Ring……. LOVE WINS! We have battles in this life of some sort every stinking day, Beloved. Our minds – emotions- tongues – are a battlefield. When we are heading to do something important to King and Kingdom, you better believe the devil is going to toss a wrench. So if we aren’t battling our flesh, we are battling demonic and worldly influences. Beloved, when we are in a long night (an impossible situation only God can fix), such battles are fierce, and fear readily climbs into the ring of life. Scripture tells us that perfect love casts fear out (1 John 4). What is perfect love? Here’s what I believe. Babe, God IS Love. That is His nature. God is perfect Love and His Love is working it’s perfection when it is received, possessed, and made full use of by us. I believe He created us as a place for Love. He desires for His Love to meet our need of it. Fear most often comes to rob of trust in God’s Love. We are made to feel like we have to earn Love by being good enough for Him. Fear constantly tells us we can’t be good enough. And you know what, if it’s true His Love is earned, the devil is correct, we can’t be good enough. But – OH, THANK GOD! – that is not truth! Truth is that God Loves us because He is Love. His love for us has nothing to do with our “do”, and everything to do with His “Who”. When we allow Him, who is Love, to abide in us with confidence that nothing we do will lose His Love, our battle with fear is finished, and we are strengthened to fight the true war: the good fight of faith that allows all He is to fill us and seep out our every pore to make all we are to possess the image of all He created us to be. Jesus in “me”, alive and well. First I think on God’s word concerning seeking wisdom, given us through James. It is promised that seeking God’s wisdom with sincere faith to trust Him will see our need of it met. Second, is James’ warning to not waver in faith, being double minded in following the wisdom given. We cannot fully follow God and be double minded. But what about Gideon’s encounter with the angel of the Lord? His faith was small and unstable, so he sought God twice for a sign that the word sent was indeed from Him and that He would fulfill it. God patiently honored Gideon’s need for assurance. Once Gideon grasped hold of God’s instruction with faith secured, his faith to heed the wise instruction of the Lord, as strange to him as some of it was, could not be stopped, and the testimony of a miraculous deliverance encourages us still today. In my first paragraph I pointed out that this unshakable, irrepressible peace comes to the heart of the one steadfast in mind. God worked with Gideon until he was convinced of God, in essence being of the same mind or thought with Him. Agreement with God’s revealed will for us, denying our flesh-mind its doubts and fears, prevents our fall to a double-minded struggle of the flesh against the Spirit. Though God hates to see doubt in the heart of His followers, He willingly works to strengthen our faith, making us stable and steadfast to trust Him who is the Rock foundation under our feet. The greater our trust in God, our Rock, the more profound our peace of mind and heart, and the faster our obedience in receiving, believing, and following His wise counsel. In my time with the Lord today, two things spoke to me for our nation and the political seas raging around us. Following the principles found in scripture, our forefathers built and established the United States of America on God’s rock. Many want to deny this fact. To do so is to tear down our foundation that is solid and has held us stable for over 200 years. Those seeking to do that, work to place our foundation on sand. That sand will shift with the storms raised up at the whim of every person who thinks they have a better way. It is vital in this election that we choose someone who realizes what is going on with the foundation of our nation; someone who knows God and whose life is founded on that Rock; someone focused to rebuild the ruins under US. This one will not be a perfect man, but he will be a man, perfected in Christ, made ready and fully equipped for service. Choosing well requires us to make our choice in the authority we have in Christ, led by Him, possessing faith and in full assurance of God’s controlling influence. As I read John 6 today, God instructed my heart to understand that Americans are looking for a Savior and are going by throngs to the one they think looks to fit that need. Fear causes us to panic and act out of a desire to save ourselves and join with those we think can deliver us. To those of the body of Christ, we already have a Savior, the Lord Jesus Christ. We need no other. What we do need is to walk by faith to support the candidate that most resembles Christ and is clearly led by Him with feet set firm on His holy foundation. Only that one is His chosen leader to take us back to our foundational roots and make our nation strong again (1 Kings 19:9-15a). 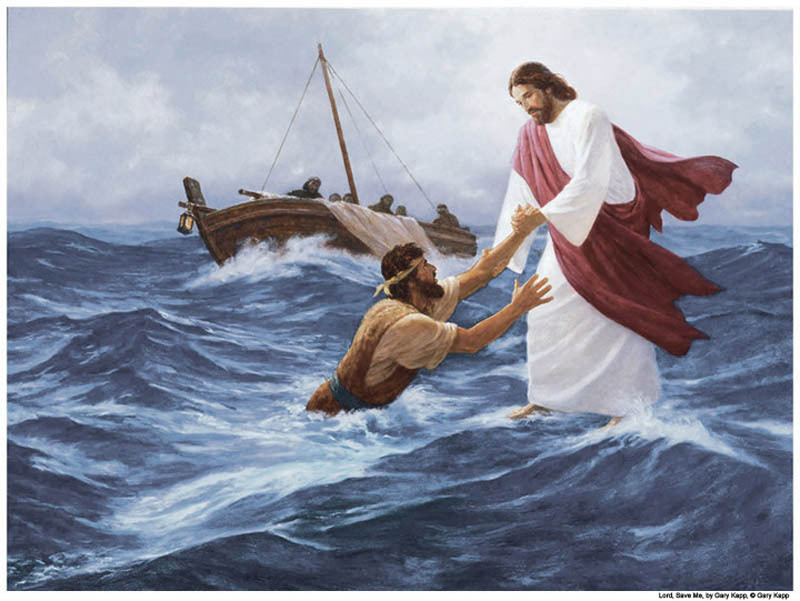 In John 6:20, Jesus says to those watching Him coming on the storm-tossed sea, “It is I; do not be afraid.” This storm that is raging around us belongs to God for His use in helping us to refuse to focus on the wave; instead, turning our attention to the Savior who is walking toward us. 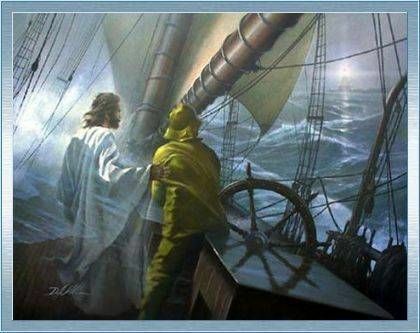 There is but one boat He will climb into with His chosen, but we have to brave the seas with Him, get on that boat with Him, and watch for Him to calm the storm. Verse 21 says, “So they were willing to receive Him into the boat, and immediately the boat was at the land to which they were going.” When we get on the sea with Jesus, He will help us find our boat and get us to the shore of His choosing. I struggled for weeks, watching every debate I could, listening to news releases, searching info online for each candidate, perusing their websites and the list of issues they have a heart to address. I settled on one several times only to find my ears assaulted by voices proclaiming all his faults, as they see it, thus being set out to search anew. The constant fighting, arguing, and character bashing between them readied me to throw up my hands up in defeat of finding the one. The minute God showed me that the bashing of character going on was raising fear in me and I needed to realize even this storm is under God’s control, peace came and I knew my candidate. Are you, like me, struggling to find the chosen? Join me today in the boat with Jesus, the author of our salvation and perfecter of faith, who chooses our leaders before we do. He will lift up in your heart the one He has chosen, and peace will immediately return despite the waves on the political seas. Search the candidates out to know their heart, yes, but do so looking for the boat Jesus is in. Once you reach shore, having found your boat, “trust in the Lord and do good” by placing your vote (see Psalm 37).